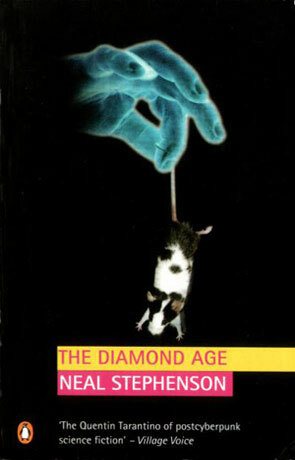 The Diamond Age is a speculative fiction novel by the award winning author Neal Stephenson. Where the core technologies of matter compilers and nanotechnology of this book is quite interesting and where Stephensons portrayal of a future based on nanotechnology is one of the best, that I've ever read, the really interesting thing about The Diamond Age is the way Stephenson lets Nell live through the Primer. Nell is a young girl, living with her brother, her loser mother and the often-changing, but seldom nice, boyfriends of her mother. The Primer, whose full title is A Young Lady's Illustrated Prime, is a teaching machine shaped as a book. It has been developed to educate young women to think for them self's and to help them survive. The Primer is interesting because it brings back an old idea, which has been brought up every time a new media has surfaced. "The radio, will bring knowledge to the illiterate masses - it will educate, and from education springs wisdom and democracy!". Similar things have been said about books, television and the Internet (and a lot of other things). And while these technologies contain the possibility to do these things, ninety-five percent of the time this isn't what they are used for, but you already know this. People simply aren't interested! They don't want to be educated and they seldom care about democracy. They want their basic needs covered (preferably a bit better that their neighbour) and then they want to be entertained. Not because they are stupid or unintelligent, but because they know that knowledge, brings dissatisfaction with things as they are and through that forces change. Very few people handle change very well. Most people hate it. I'm no better. But enough ranting and back to the Primer. Could the Primer work where all these other technologies has failed? I don't know, but The Diamond Age presents some interesting cases where the Primer works in different ways. Stephenson uses five hundred tightly typed pages to tell the tale of Nell and the Primer, as she evolves from a young girl to a young woman. Most of the story centres on Nell, but there are a lot of background stories and characters and sometimes it all becomes a bit too much. At times it fells like Stephenson has created a world so fantastic and unbelievable that it crosses into the fairytale world of the Primer and becomes unreal or nearly dreamlike. And here in lays both the strengths and weakness of the book - the descriptions of Nells reality is harder to imagine and believe, than her fantasy world in the Primer, which sometimes leaves the reader (well, me at least) with a less that firm grasp on the story.